Seriously? OMG! WTF?Glee Archives - Seriously? OMG! WTF? Has Glee’s Josh Sussman hit hard times? Josh Sussman or Glee’s JewFro, as he is better known as, was seen working at 7-Eleven, so has the actor hit hard times? Far from it. He is working for the store, but he is doing commercials for them like the one above. What is Lea Michele doing? Besides her new husband? 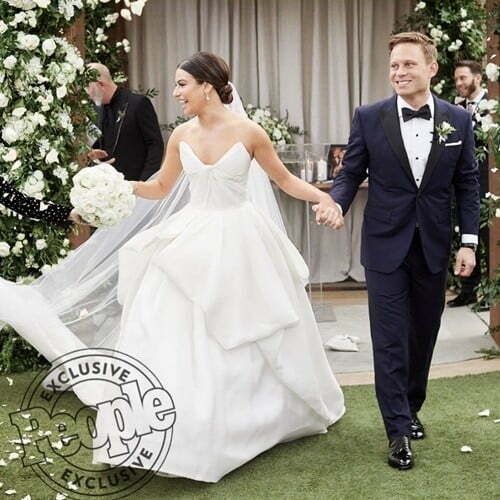 After three engagements, Lea Michele finally walked down the aisle yesterday. The Glee star married Zandy Reich in Northern California in front of their most loved ones. No word if she sang at her wedding, but I would be surprised if she didn’t. I guess Darren Criss won’t be acting ever again? Then he explained, “The reason I say that is because getting to play those characters is inherently a wonderful dramatic experience…It has made for very, very compelling and interesting people.” Roles which made him a star and gave him an Emmy. This is just me, but I don’t believe that is the reason why he does not want to play the same characters that he played in Glee, American Crime Story and Hedwig and the Angry Inch. I think he just does not want to do it anymore now that he has an award-winning actor and is married. If you get what I am saying. But I could be wrong.